﻿ Lisboa Card (Lisbon Card) - Discounts for You! Lisboa Card - discounts for you! When you come to Lisbon, I recommend that you buy the Lisboa Card. This card gives you free admissions or discounts in almost all museums and monuments you may want to visit. Examples of places where you can take advantage of the free admission are the Jerónimos Monastery (Mosteiro dos Jerónimos) and the Belém Tower (Torre de Belém). Or the Coaches Museum (Museu dos Coches Reais) and Tile Museum (Museu do Azulejo). By the way, these are two fantastics guardians of portuguese history! Don't miss them. With this card, you can use many of the public transportations for free. The Carris Buses (the only public bus company inside the city), trams and Elevators are free. 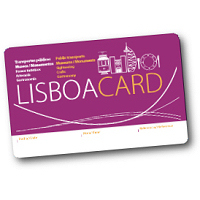 The Metro de Lisboa (subway) and the main train circuits of CP (Caminhos de Ferro de Portugal) arround Lisbon are also free for you (if you have the card, of course). If you go outside the city, to visit some of the spectacular sights and places like the National Place of Mafra or Queluz, take your card with you for free admission. The list of discounts is huge! Click here for a complete list of all discounts and free admissions available to you. Note: I'm not making any money with this. I'm not trying to convince you to buy. This is purely informative and you should consider if it is really a good option for you personally. Some people, simply doesn't like museums and monuments and probably won't take advantage of a large portion of the discounts available. Maybe, you are more attracted to the Lisboa Restaurant Card that gives you discounts in Lisbon Restaurants. If that's the case, find out more about this card. You can buy your card at the Tourist Information Office (Lisbon Welcome Center) at Plazo do Comércio or at the Lisbon Airport (if you're arriving by airplane). It can be collected in one of the places metioned above. More details on purchase. Important: the card is only activated the first time it is used on public transport or the first time it is used at a participating establishment, NOT when it is purchased.